Bath is a beautiful town with really an unforgettable name. 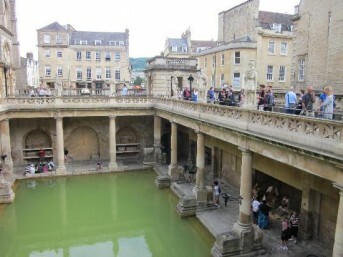 Yes this is where the word bath comes from the town was established as a spa in Roman times. At hog roast Bath we’re passion-fuelled hog roasters with a professional catering grounding, we believe this combination is what has made us so popular. We have an advantage on all our competition because the other hog roasters in the country don’t have the professional culinary background that we do and considering Bath hog roasts are the best food in the world it should become clear that the matter is settled – we’re the best company for your event! 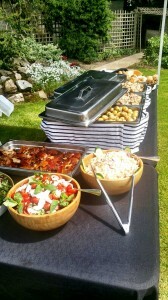 Spitting Pig catering is the perfect choice for a Bath wedding hog roast, a corporate event, or a family party. 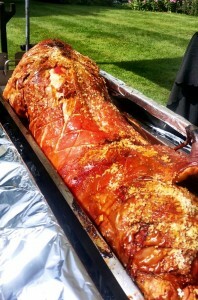 As we’ve catered for so many events and have great menus specifically for a hog roast in Bath that are just as varied we’ve got the familiarity with different occasions and can therefore make excellent catered meals not just at a wedding, not just at a birthday party or corporate breakfast, but for literally any and all occasions. You get to choose from a diverse compilations of menus, you get to pick a menu and make further changes to it if you aren’t sure about a certain aspect, ultimately you get the final say in what you’re eating. Spitting Pig bespoke menus are the stuff of legend. We’ve cooked everything from zebra to pheasant en-masse. The reason that we can provide such an epic catering service with such an excess of different foods is because we’ve invested so much of our profit into taking hog roast machines to a new level, that means making our own machines, from scratch, with expert help. What’s resulted is a fantastic collection of hog roast Bath and spit roast machines that have made our catering service better than ever, but also opened new doors for us and for the hog roasting industry. One door that’s opened for us and our customers is a service we created called Spitting Pig hire, a machine hire service that enables folks to hire the equipment we use, rather than hiring the equipment, and a chef, and waitresses, and a menu, etc. Succulent whole roasted hog roast Bath meats, whether pig or turkey, is what we live and breathe, and occasionally eat if there’s any left over after an event! Hiring a hog roast Bath machine is fast, it’s easy and it’s much less time consuming than getting all the menu details and event plans right when booking catering. The hog roast machine needs booking for a certain day and a certain period of time and that’s it, beyond that you’ll need no further contact with us, you can plan yourself what you want to cook with your machine and choose when to took it, it’s as easy as that. Our spitting pig hog roasting machines are just so versatile, you can cook so many different meats on them. I have not come across a meat yet that we can not cook to perfection on them from spit roaster Turkey to Lamb to Beef we can cook just about anything on them the possibilities are endless when it comes to spit roasting meats and everyone is sure to enjoy it because the meat will cook in its own juices so it does not get any moister or tastier than what it does when it has been cooked on our hog roast Bath machines. If you need menu ideas you can of course stay in touch with us and we’ll give you some wonderfully useful information on some of the meals that we make with the hog roast machines, and more importantly how we make them we are a team of professionally qualified chefs so we are very imaginative when it comes to food so we can create a dish from anything and make it taste fantastic. We don’t mind spilling the beans and sharing our hog roast secrets and recipes with you because once we tell you we will hopefully receive a booking from you so why not enquire today and we will be more than happy to help you with your choice of menu to make sure you have a happy service for you and your guests because there is nothing worse than paying for a catering provider for a special celebration that is important to you having high expectations of the food then being let down because the food just is not as good as you thought it would be Spitting pig are a reliable company and we really do go the extra mile.